The skills people require to perform at their optimum throughout the working day, such as patience, focus and diplomacy can be fuelled by the food they’ve eaten; while ‘the wrong kind of fuel can derail their whole day,’ a new academic report has found. 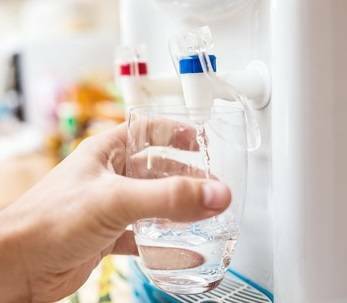 And the study in the journal Food, Culture & Society: An International Journal of Multidisciplinary Research reveals that water is the main redeemer of ‘negative nutrition’ in the workplace; not only because it provides vital hydration for physical wellness but because it encourages people to walk to the watercooler or break out area to drink. According to the researchers, a culture of grabbing something quick to eat amid a mounting pile of to-dos at work often leads to making the wrong decisions when searching for something to eat in the workplace. Unplanned cakes and the emergence of ‘food altars’; central places for leftovers from work meetings or unhealthy snacks present workers with endless choice. In the report, published by Taylor & Francis, researchers Carolyn Thomas, Jennifer Sedell, Charlotte Biltekoff and Sara Schaefer explored eating habits in the workplace where “individuals frequently navigate treacherous food choice landscapes during the working day.” How much self-control do individuals exert at work in relation to food? 25 office workers at the University of California, Davis recorded what they ate and where they consumed the food in a 24 hour period, rating their choices in terms of goodness and healthiness. According to the study, it is not always possible to plan, buy, prepare and pack a selection of foods in advance of going in the workplace. It requires work and effort to eat healthily. Workplace eating is not just the procurement and preparation of food, it is far more complicated, ‘invisible efforts.’ Dietary goals for participants at work include: minimising carbohydrates avoiding fried food, calories and portion size. The study demonstrates a matrix of food decision making, eating the correct foods can maximise work performance as does feeling good about choices made. Often skills required for a job such as patience, focus and diplomacy can be fuelled by the food eaten to enable the body and mind to function at optimal capacity. The authors note that “the wrong kind of fuel can derail the whole day.” One example is from Karen whose morning muffin made her feel sleepy and sapped her energy levels. The study examines the deterioration and amount of labour that goes into attempting to choose well or failing to select the right food in the workplace. Control is a big factor in workplace eating. Kevin who brings a packed lunch to work comments, “you control yourself much better when you dictate what you put in your lunch.” However, encountering unplanned foods in common places can break down the best of intentions. One worker avoids buying treats at home, she comments, “I eat stuff that I like and I eat stuff that I see,” but she cannot control the food types that appear in the workplace. The best of planners may prepare wholesome food to bring with them to work but even they cannot prepare for the birthday cake that magically appears in the afternoon or the scones that turn up at a meeting. One participant revealed that contemplating eating an unhealthy treat may sometimes occupy two hours of a morning meeting. The study shows that a lot of energy and time is dedicated to negotiating a myriad of feelings related to food at work. Navigating workplace food choices requires mental labour, careful planning, calculations of calorie, carbohydrate and fat intake and their effects on work performance. Water provides the opportunity to make a positive nutrition choice.